The clients’ desire was for a weekend house designed as a compound, a group of buildings like old farm houses with a house, a barn, a silo, etc. separate structures but related to each other. Though the lot was relatively small, a house plan was developed as three separate units – linked together by an extra wide, passageway with a 40 foot long skylight. 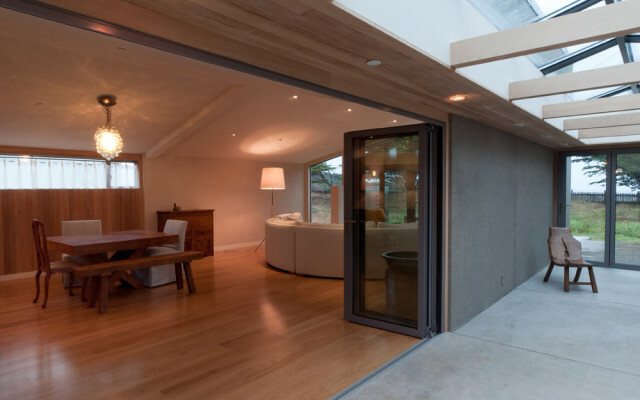 The insulated concrete pre-fab wall panels were the clients’ idea. They had worked with a woman who had used these panels on her own house. Only a few houses built on the north coast have used this construction process. The panels, prefabricated elsewhere, are trucked to the site. 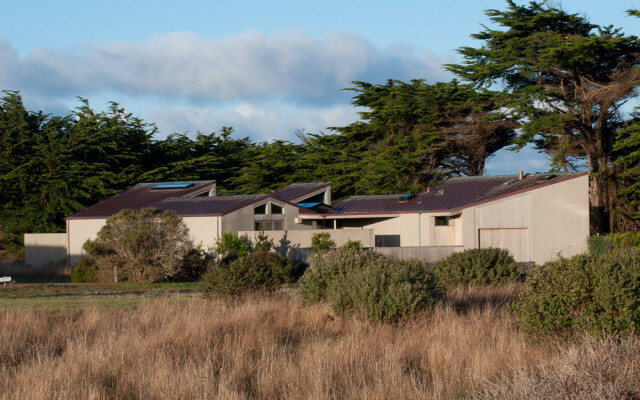 It was a challenge in the case of this house to truck huge, heavy concrete panels over the narrow coastal roads to the site. The larger panels weigh several tons and have to be lifted into place by crane. But once the panels arrived, all the house’s exterior walls were assembled on site in two days. Unlike the clients’ friend’s house which was stuccoed over to hide the concrete; we sand basted the exterior of the concrete walls to give the walls an even texture and left them with the concrete surface exposed. 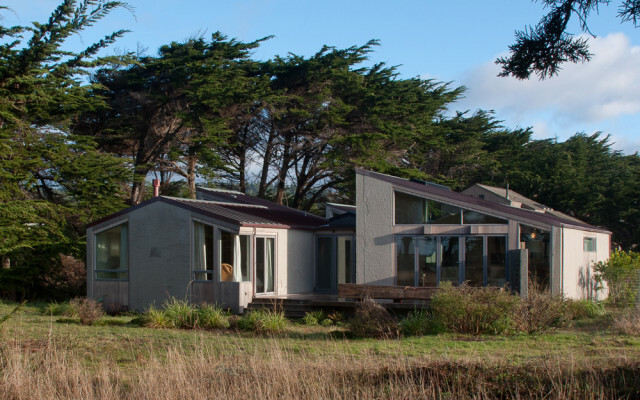 The gray color of the concrete fits well with the building colors which are strictly regulated by The Sea Ranch Design Association. The house has multiple exterior bi-folding glass doors that function like transparent walls allowing the inside and outside to become one. These doors are pricey, but the resulting effect is very special. 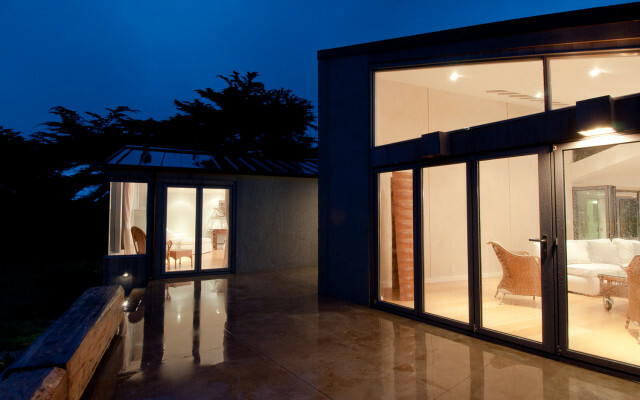 Even with a large amount of glass, it’s a very energy efficient house. A boon, since this part of the coast is a year round heating climate. 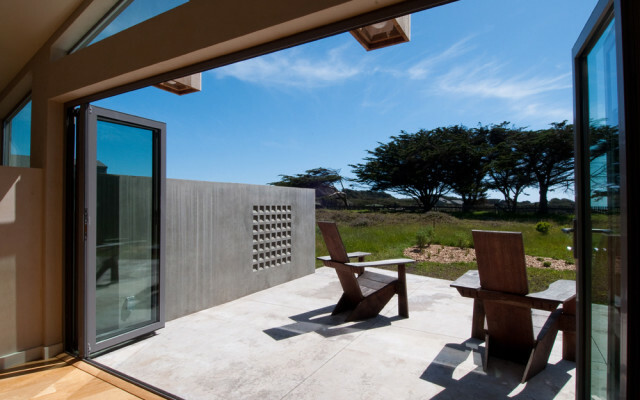 As long as there is sunshine, the concrete walls’ thermal mass keeps the interior house temperature fairly constant. Being comfortable outdoors at The Sea Ranch, or anywhere along the north coast, generally requires some sort of wind protection. With the sun shining or even with fog, it is usually pleasant outdoors if the wind’s not blowing on you. For the courtyard, we already had an existing cypress hedge row wind screen. For the rear deck, we projected out the windward end of the building to act as a wind screen for the deck. And for the little BBQ deck off the kitchen, we had the other windward side of the building functioning as a wind break. The wall that extends from inside the living room through the glass wall out along the south side of the view deck acts as a privacy screen for both the deck and the living room, in case the future neighbor’s house might look across this area.